"Married. Sackett–Brewer—Mr. J. E. Sackett, Evanston, Illinois, U.S.A., to Miss Margaret Brewer, Melbourne, Victoria. No cards. No cake. Nobody's business." —New Zealand Evening Post, 4 May 1878. In September 1885, J E Sackett opened a Dime Museum at Hennepin Avenue, Minneapolis, MinnesotaG, in partnership with E W Wiggins. The venture was extensively promoted with articles and advertisements in the St Paul Daily Globe. The museum displayed all manner of curiosities, including stage productions. In June 1886, Sackett & Wiggins announced plans to build a new theater at the corner of First Avenue and Fourth Street. Jacob was then living in Chicago. Sackett & Wiggins were said to control theaters and museums in Chicago, Grand Rapids, and Kansas City. Jacob had recently sold his interest in the Cleveland theater. In the following year, they were involved with others in setting up the Murray Opera House Company. By the end of 1887, the firm of Sackett & Wiggins was in financial trouble. While the Dime Museum was reported to be profitable, the loss-making Hennepin Avenue theater and the commitment to build another theater in St Paul had overstretched their resources. The firm was declared insolvent in February 1888 and a receiver was appointed. Several parties were interested in taking over the business and it was sold by auction later that month. The deal was mired in controversy, even resulting in a free fight in which the attorney for Sackett & Wiggins had his nose broken after refusing to give up the Dime Museum building to the receiver. Jacob Sackett was still active as a museum proprietor in 1890 when the English Syndicate was reported to have taken control of the freak show houses in Sackett & Lawter's circuit at Omaha, Missouri, and Lincoln, Nebraska, leaving Sackett & Lawter with a one-fifth share. Jacob was named in his father Orsemus's will. He and his brothers Henry and Fitch were left just one dollar each, the residue of their father's reportedly considerable estate being divided among his nieces, grandchildren and great-grandchildren. 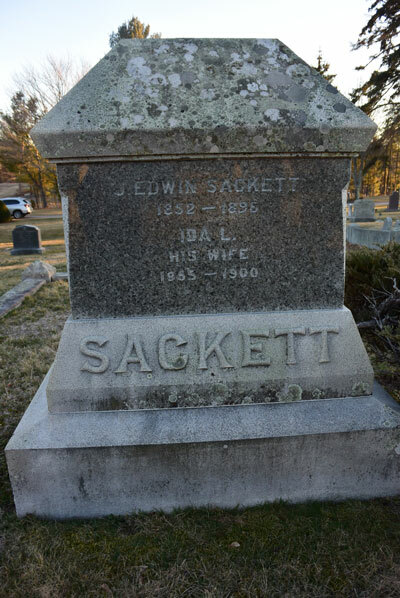 "Illinois, Cook County Deaths, 1878–1994", database, FamilySearch, "J C [sic] Sackett, d. 29 Aug 1898, at Chicago, Cook, IL, address 103 State St, male, 49, married, b. New York, bur. 31 Aug 1898, Goffstown, New Hampshire, informant J R Boynton." Website Illinois State Archives (http://www.ilsos.gov/), Deaths Index, "Sackett, J E, d. 29 Aug 1898, aged 49, Chicago, Cook County." "New Zealand Marriage Index, 1840–1934", database, Ancestry.com, "1878, Jacob Edwin Sackett & Margaret Brewer." "Colorado, Divorce Index, 1851–1985", database, Ancestry.com, "Denver, 22 May 1883, Jacob Edwin Sackett & Margaret Sackett." "United States Marriages", digital image, Findmypast, "24 May 1883, Denver, Colo, Jacob E Sackett to Ida Curtis, by C H Marshall, Min." Edwin J Sacket, 5, gson, b. Chenango. "US City Directories, 1822-1995", digital image, Ancestry.com, St Louis, Missouri, City Directory, 1883, "Sackett, Day & Gregory (Jacob E. Sackett, Thomas B. Day and Frank Gregory) museum, 24 S, 4th." "Sackett Jacob E. (Sackett, Day & Gregory), r. Everett House." "US City Directories, 1822-1995", digital image, Ancestry.com, Indianapolis, Indiana, City Directory, 1885, "Sackett Jacob E, director Indianapolis Dime Museum, bds Bates House."